Staff morale and company culture is a recipe that corporate South Africa is tirelessly trying to get right. Better workplace facilities, well-being programs, more flexibility, and increased perks, are, for the most part, expected by a skilled workforce that is seeking the right environment to nurture its talent. What has been growing as a trend in this area has been the rise of high street retail brands in large corporate environments, providing staff with access to retailers, QSR (Quick Service Restaurants) and coffee shops on the ground floor of the building a place to save time, meet friends, work or engage in a meeting. It's an intelligent move. Coffee is a growing market with Statistics SA showing that coffee shops have contributed to around 2.8 percentage points of the positive annual growth around takeaway and fast food, and so South African brands have cottoned on to a huge opportunity access to the foot traffic of thousands of consumers from Monday to Friday. 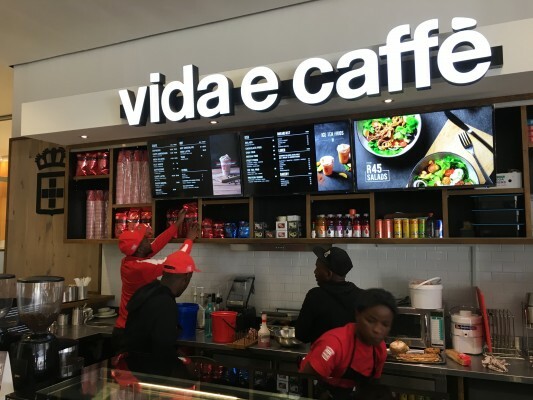 According to Hitesh Patel, new business director for vida e caffè, "Employers want the brand association of a high street offering, less down time, and an association with qualitya one-stop shop without having to leave the building. A lot of the clients that we service see it as a value add to their staff." "By the same token, we found there was a demand from the staff for a high street brand as opposed to a corporate or generic coffee shop caterer. The staff were prepared to pay for it too, wanting a more upmarket quality cup of coffee, vibe, and service. 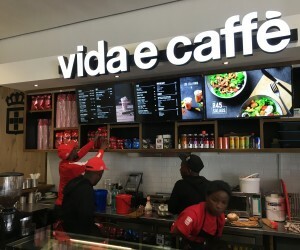 vida e caffè opened its first corporate store in late 2012 within the Standard Bank Simmonds Street office, and this soon led to other organisations seeing the formula and requesting the services within the headquarters or super branch. Brands such as EY, Multichoice, Vodacom, MTN, Old Mutual Cape Town, The University of Stellenbosch Medical Centre, The Foschini Group, Liberty Life, KPMG, and Sanlam Santam followed suit. The positioning of the store has been key to its success. Often situated in a "swing space" – on the ground floor near the entrance - the coffee shop has become a connection hub, and staff occasionally choose to meet there as opposed to in their office. Patel continues, "What has been most interesting is the buy-in from the staff. It has surpassed our high street environment, due to a blend of critical mass, good coffee, and quality food at the right price point. We see a lot of footfall, and not only from the staff, but also via members of the public as they can meet in the coffee shop too, depending on where it's situated." The product trend within corporates is toward "value add". Customers gravitate towards "combos" items like coffee and a cornetti (a Portuguese pastry) for R30. But feedback is also positive around the speed of service, with staff often in more of a hurry, and the outlet being geared towards minimising queue times. There's also an added bonus. Staff are able to redeem their loyalty points too, giving them a free coffee via Discovery Vitality." He concludes, "This corporate model works really well for us. We've created a niche operating space especially from a coffee shop point of view. We often get potential franchisees who see the model work, and want to invest in a store, so it's also become a sales platform for us, leveraging us into different avenues a self-marketing exercise. What we have is flexibility no two floor layouts are the same. It’s tailor-made to the client – it's really case specific to match the right client and their footfall." Future corporate stores launching in the next couple of months include the new Discovery headquarters in Sandton, Siemens, Metropolitan Life Buildings in Bellville and Centurion and four stores within Dimension Data’s offices in the Campus, Bryanston.